From design to shipping, our staff is dedicated to delivering you sound castings. 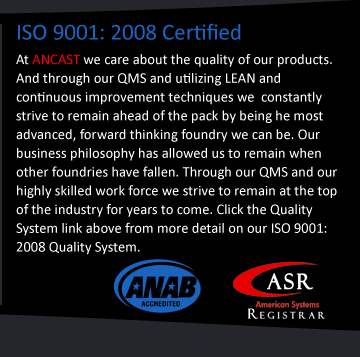 Whether it is for a small order utilizing a 250 pound furnace or large jobs run in 5000 pound heats, ANCAST pays attention to the details necessary to deliver on-spec castings. A coupon from every heat is tested with a vacuum spectrometer prior to pouring to insure the alloy meets the chemical specification. ANCAST utilizes the latest computer software to measure and record this data and fully documents each heat. In an area generally characterized by manual processes, ANCAST's finishing department is striving to update and mechanize the finishing process. We are constantly testing for better cut-off methods, abrasives and finishing techniques. Stainless Steel Casting, it's what we do best. Our talented staff will work with you through the process of creating the perfect stainless steel casting to suit your needs. Our engineering department will assist you in finding solutions to specific problems involving corrosive, hot, or abrasive materials. 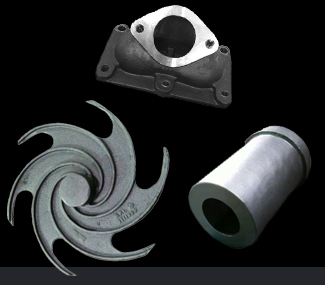 We will answer your questions about the unique properties of high alloys and together with your engineering staff, we can play a role in the design of your parts to insure they meet the design criteria for stainless steel castings. And at ANCAST we have the capability to create products out of many different alloys. Please check our Alloy page for more detail.